My plan for running the marathon this past Sunday was to finish. Given my not so stellar training this summer, I wasn't expecting too much. I was going to run in the 10:20 -10:30 range for as long as I could. I knew that the chances of me running running a 4:30 or getting under last years time of 4:31:08 were pretty slim. So, like I said, I was just going to go out, run for as long as I could and slow down or walk if I needed to to finish. Leading up to the race I didn't really feel like I was going to be running a marathon - it just seemed like another 'long run.' I didn't have that nervousness or doubt. Sure, I wasn't sure how well I was going to do, but I knew I could cover the distance. Saturday morning I did a two-mile shakeout run with the girls. I've never done a day before marathon shakeout run. It was fun and relaxing. Afterwards we hung out and had donuts and coffee and talked about all the stuff one talks about before a marathon: what we're wearing, what the weather is going to be like, where and at what time we were going to meet up. The rest of the day we just hung out. Baby H. and I watched 'Monsters vs. Aliens' and we went to Target - nothing too exciting. One of the running ladies hosted dinner and we had some great pasta and meatballs with everyone. After dropping Baby H. at my sister's house for the night, we headed home. Though I had been feeling fine, now the nerves started to kick in. My back was hurting and I was feeling really bloated. I retired to the couch with a heating pad hoping that it was temporary. Making sure we're ready to run! The morning started the usual way. We got up, ate, got dressed all that stuff you do before a race. I wasn't feeling bloated nor was my back hurting anymore so that was good. Since Mr. H. wasn't working the CARA VIP area before the race, we didn't have to rush to get downtown, which was nice. After many 4:30 a.m. alarms, having to get up at 5 and out the door by 6 really doesn't seem that bad. Once downtown we hung out at the CARA VIP area, and I met up with the other 10:30 group. There were a few first timers that were nervous, and a bunch of us that were at least pretending not to be nervous - or forgetting how hard this was going to be. It's weird, you think you'd remember that feeling of hitting mile 20, 21, 22 and the way your body just aches and longing to be done. But you don't. Even now I don't really remember it. It must be how I am able to do this every year. Anyway, we hung out until it was time to go, Mr. H. and I said goodbye to each other as he headed to corral B and we made our way to corral G.
And then we stood around. We joked, we took pictures, we listened to Born to Run. Before we started, Laura said she was going to stick with me because I said I was going to run 10:30s. For the first 5k we stayed pretty much at that pace clocking a 10:27. A couple of our group had already lost us as they went off much faster than that. By 10k we had lost the group that was behind us. Our second 5k was at a 10:12 pace and the next 5k at a 10:11 pace. As usual, the first 10 ,miles seem to go by so quickly. Laura looked for friends through the Gold Coast. 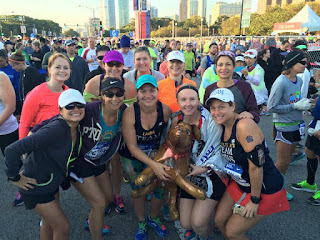 We saw a running buddy at the turn around at Addison and then I saw several groups of friends as we made our way back up Broadway and Clark. The distance on both of our watches was off because being downtown always messes with the GPS, and I of course forgot to turn off the auto lap on my watch. So each mile we looked at the time on our watches, calculated what time it should be if we ran a 10:30 and tried to keep ourselves on pace. Realizing we had a few fast miles, we slowed down a bit and ran the next 5k at a 10:21. Somewhere around mile 12 I think I noticed I was chaffing under my arms. I asked Laura to remind me to get some Vaseline the next aid station. As luck would have it, a woman was bringing out a fresh batch of Vaseline (if you'v never seen how they hand out Vaseline during a race it's pretty weird. They have pieces of cardboard with big globs of it that you can just scoop up. Sometimes there are tongue depressors stuck to the boards for applying it. Apparently some people aren't familiar with what it is and I've heard stories of people trying to eat it - ugh). Anyway, I grabbed a glob, spread some under my left arm pit, tried to get a little bit under my right one (which really wasn't bothering me at the time but I figured better safe than sorry) and went on my way. At the half way point I was feeling pretty good, and happy that we had been able to keep an average pace of 10:17 - on pace to hit a 4:30. But I wasn't letting myself think about that. 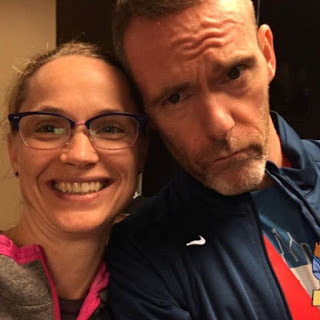 I know that the real race doesn't start until mile 20 and that's what I was telling myself - I just needed to get to mile 20 and then I could asses how I felt. Meanwhile Laura and I continued to have fun, dance to the music as we went through the charity block party and laugh at the great posters. As we headed East on Jackson Blvd. 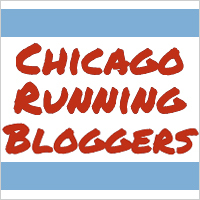 a runner came up yelling "I'm loving Chicago" to the crowds. We asked where he was from, Tennessee maybe (totally can't remember), and told us that Chicago had the best crowd support. I couldn't agree more. Between miles 15 and 19 we sped up again, averaging a 10:11 pace btween 25k-30k. I blame how boring Ashland and 18th street are at that point. We made it to mile 20 and the aid station that directly follows it. Up until this point, Laura and I had been discussing what we were going to do at each aid station - if we were going to gu or get water or Gatorade. This was a gu station (most likely the last) and I didn't think I could handle anymore Gatorade. We had been only walking as much as we needed to to get water. I started to take my gu, but I couldn't really stomach it so only got a bit down. I grabbed one of the bananas, took a bite, had a couple sips of water and started off again. Because I had walked more than I had been, I lost Laura. I probably could have caught up to her - I saw her colorful capris ahead of me - but it was time to let her go. I feel silly saying this, but I knew Laura could run a sub 4:30 and I didn't want her to miss that by staying with me. I had told her earlier that if she needed to speed up then she could, and she kindly said the same thing to me. We agreed we were happy at a 10:30 pace, but clearly we had been going faster than that, and I wasn't sure how much longer I could keep it up. So I didn't work to catch up knowing that I needed to slow down and she most likely didn't. The next six miles were pretty much running from aid station to aid station. From kilometers 30-35 I slowed down to a 10:30 pace on the nose. I allowed myself to walk a little bit longer through the water before starting off again. But as I rounded 35th and turned onto Michigan, those walks got longer and longer. The next 5 kilometers I had slowed to a 10:59 pace. At mile 24 I had looked at my watch and, if my math is right, which if you know how difficult it is to do math while running long distances you'll know that's a big if, I was still within striking distance of a 4:30. I just needed to run the last two miles at a 10 min pace. Was this within the realm of possibility? Who knows. Probably not. But for a few seconds at least I was going sub 10. But yeah, my body and mind was like, nope, that's not going to happen, and so I tried to figure out if I could still PR. There's a whole minute and eight seconds after 4:30 that would mean a PR. I didn't let myself stop for the second to last water station while I was trying to figure all this out knowing that if I came close I'd be mad at myself for giving up without at least trying. But as I hit mile 26 and the final aid station, I knew it was not to be. And I was actually relieved. I would still run, but I wasn't going to kill myself for a time that I wasn't going to hit. In the end I finished at an overall pace of 10:23 - better than the 10:30 I said I was going to run and way better than the finish I expected. Happily, Laura did just as I suspected and finished in 4:28:11. All of our group had pretty good runs, and several, Laura included, had whopping PRs and went under 4:30. Mr. H. and me goofing off after finishing the marathon! So all-in-all a much better run than I had anticipated. It's easy to second guess myself - could I have gone faster? Should I have pushed myself more? But in the end, I did what I did and I'm proud of that. I have been much sorer than in previous years and I'm taking that as a sign that I pushed myself as hard as I could. Of course, there are lessons to learn from this training season, and I have lots of time to think about that. Sometimes I wonder if I should stop running so much. I enjoy it, I enjoy the camaraderie and racing, but it takes up a lot of time. Something to think about. For now, I'm happy that it's over. 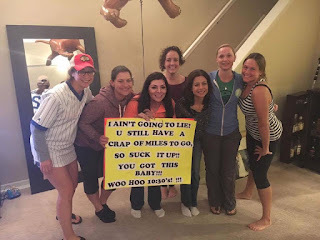 A bunch of us are running the Country Sole Half Marathon on October 22. It's a long story about how I ended up running this race which I'll save for another day. 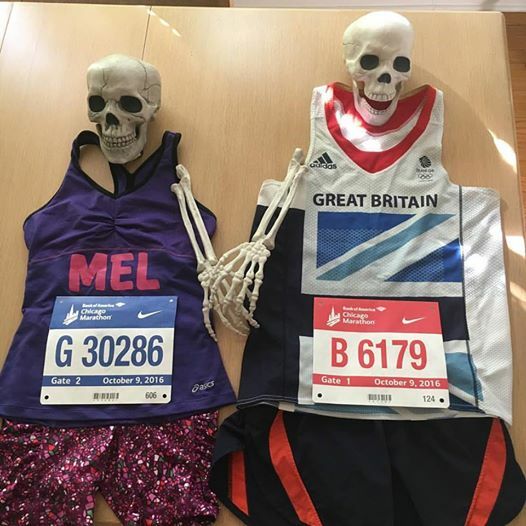 Oh, finally, one other piece of news - Mr. H. had a GREAT marathon. Not only did he PR, but he qualified for Boston by several minutes with a finishing time of 3:08! I'm so happy and proud of him and can't wait to go to Boston in 2018.